The holiday season is my absolute favorite time of year – not only because of the yummy food and the giving spirit that’s in the air, but because I love getting friends and family together to host parties! Being a healthy food blogger, I get so much joy from creating delicious recipes and spreading holiday cheer to my loved ones through food and drinks! This year, I thought what better theme for a holiday party than “Healthy Holidays”? I love the holiday season, and want to continue my healthy living to enjoy this time of year to its fullest, so I put together a Healthy Holidays party to help spread some healthy holiday cheer! My inspiration for the party was Emergen-C, a dietary supplement served as a drink that is packed with B Vitamins, Antioxidants, and Electrolytes. We all know its best to eat nutrition-dense food and exercise daily, but Emergen-C helps give an extra boost of vitamins to help me feel refreshed, restored, and complete in my healthy lifestyle. For my party, I headed to Walmart to get Emergen-C 30 count boxes in my favorite flavors: Tangerine and Raspberry! Now that I had my two most important items, my Emergen-C, for my party, all I had to do was pick up lots of delicious fresh fruit, a couple ingredients for my Emergen-C party beverages, and few party decorations to set up my Healthy Holidays themed party! Step 1. Put 1/3 cup of raspberries into a blender or food processor, along with 1/4 cup of water and 1 tsp of honey (or maple syrup). Blend until its a smooth puree. Step 2. Pour your puree in a tall glass. Pour one packet of Emergen-C raspberry into the glass. Step 3. Top the rest of your glass with ice and club soda, and stir until your Emergen-C is dissolved. Step 1. Put 1/3 cup of tangerine slices into a blender or food processor, along with 1/4 cup of water and 1 tsp of honey (or maple syrup). Blend until its a smooth puree. Step 2. Pour your puree in a tall glass. Pour one packet of Emergen-C tangerine into the glass. Now that you have your fizzy festive Emergen-C drinks, it’s time to put together the rest of the Healthy Holidays party! For decorations, I think simpler is better. I think food is colorful enough, and should be the main focus. As for the non-food decor, I love to use simple, yet boldly colored decorations. This makes a party look festive, without looking too cluttered. See? Mainly food! I added a couple red banners across the food table, and above, to tie the whole party together, as well as coordinating napkins. On a chalkboard I had, I wrote “Healthy Holidays” and placed it on my mantle. You could easily do this on a chalkboard or whiteboard, to help tie the whole theme together, and create a cute, clean DIY look. For the party goody bags, I put in a piece of fruit, and a packet of each of the flavors of Emergen-C I purchased from Walmart. I love putting items like these into goody bags, since I know they are gifts people will definitely get use out of — they are a treat, tasty, yet practical and healthy! I placed them in goody bags, tied them closed with twine, and then placed them in red baskets. The red baskets were made complete with miniature chalkboards that I tied on with twine. For the main food item, and to compliment the fruity theme of the Emergen-C, I created a Christmas tree fresh fruit platter! I used green apple slices for the main part of my “tree”, raspberries to represent ornaments, and tangerine slices to represent the star on top. And of course a party wouldn’t be complete without a delicious dessert! I created a very simple, easy-to-make dessert: fresh raspberries and blackberries, topped with light cream. It tastes fresh, doesn’t take a lot of time to prepare, and is always a crowd pleaser! Before starting the party, I topped off my Emergen-C festive fizzy drinks with a holiday drink stirrer (also perfect for stirring the Emergen-C powder thoroughly). Toasting for a Healthy Holidays? I’ll cheer to that! I hope you find delicious and refreshing inspiration to create your own healthy holidays! To learn more about Emergen-C, you can visit their site here. 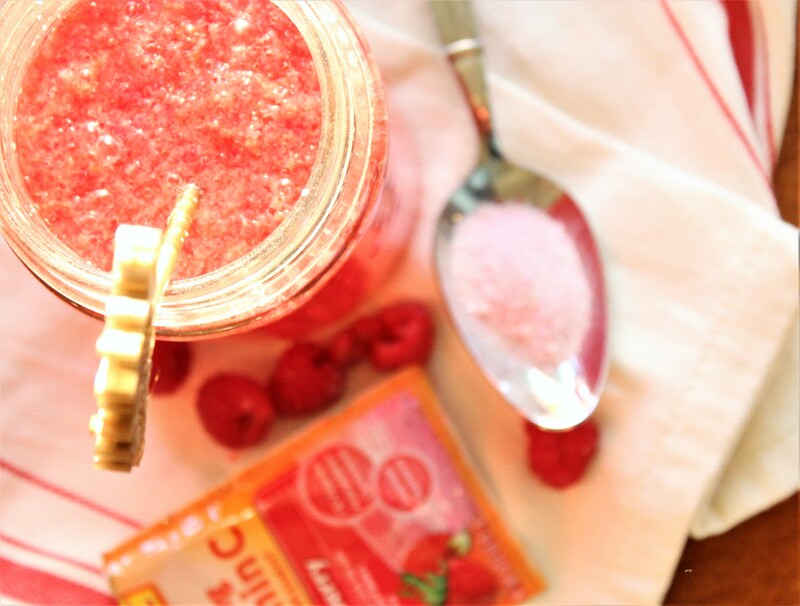 You can purchase Emergen-C to re-create my fizzy festive holiday drink by clicking here. This is awesome! I also visited Emergen-C’s website and was thrilled to see their partnership with charity:water, one of my favorite charities! Well Done!